It seems that the influence of the geopolitical tensions have been stronger than the impact of FOMC meeting minutes and the CPI data on EURUSD. 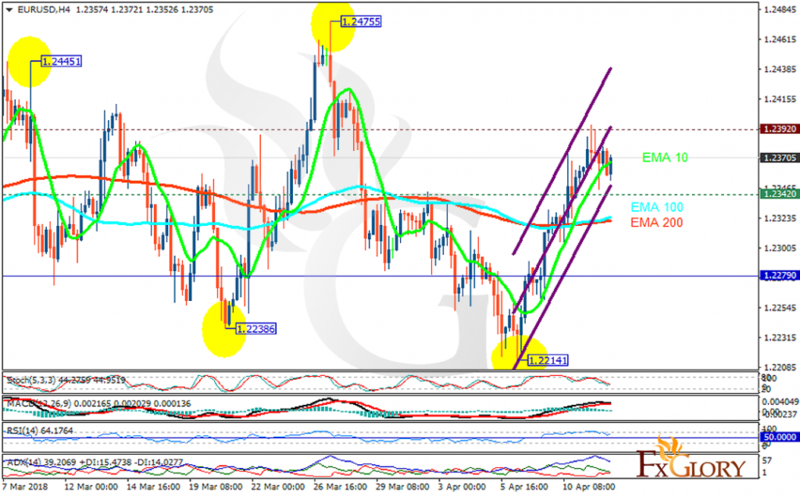 The support rests at 1.23420 with resistance at 1.23920 which both lines are above the weekly pivot point at 1.22790. The EMA of 10 is moving with bullish bias in the ascendant channel and it is above the EMA of 200 and the EMA of 100. The RSI is moving in overbought area, the Stochastic is showing downward momentum and the MACD line is above the signal line in the positive territory. The ADX is not showing any clear signals. Long positions are recommended towards 1.245.